Nearly 40 percent of murders in America went unsolved in 2017, according to FBI national crime data. Just 61.6 percent of murders were solved last year, putting the likelihood of getting away with murder at about 38 percent, FBI data shows. The numbers look even better for those who would commit lesser crimes, with about 47 percent of aggravated assaults going unsolved and about two-thirds (65.5 percent) of all reported rapes failing to be 'cleared' last year. The percent of solved murders has held fairly steady since 1995, but remains far below the 1965 rate when more than 90 percent of U.S. murders were solved, according to the Murder Accountability Project. The FBI defines its 'clearance rate' as the percentage of crimes that are resolved in arrest or 'by other means,' such as charges filed or a case turned over for prosecution. The numbers measure the number of crimes, not the number of people arrested; in some cases multiple people may be responsible for one offense. In addition, some clearances are from crimes solved in 2017 but committed in years prior. Robberies were cleared at a rate of 29.7 percent, while property crimes were closed at rates below 20 percent. Despite the grim statistics, FBI data shows that crime rates were down 3.3 percent overall in 2017 – largely due to an ongoing decrease in property crime. Last year was the sixteenth consecutive year in which crime decreased overall, according to an analysis by the Brennan Center for Justice at NYU School of Law. The national murder rate fell less rapidly – by 1.45 percent in 2017 – to reach 5.3 murders per 100,000 people. Collectively, America's 30 largest cities had a 2.4 percent decrease in murders. In Chicago the murder rate fell 14.6 percent, with 112 fewer killings in 2017 compared to 2016. The number of resources being allocated to solving homicides is not enough,' said Bruce E. Harry, a forensic psychiatrist who is on the board of the Murder Accountability Project, in an interview with DailyMail.com. 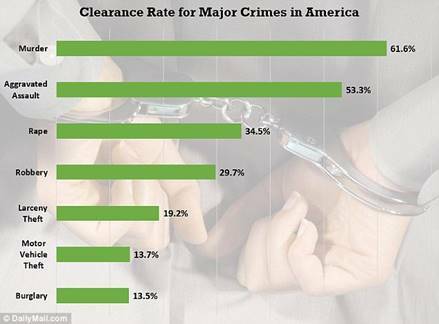 Despite the national numbers showing an overall decrease, the rate of crime clearance can vary from one community to the next – and based on the demographics of the victim involved. The Post analyzed killings from the past decade in 52 of the largest American cities, finding that police made an arrest in 63 percent of the killings of white victims, compared to 47 percent of those in which the victim was black. And, many crimes go unreported. Roughly half (47 percent) of violent crimes and 35 percent of property crimes in the U.S. were actually reported to the police in 2015, according to a 2017 report by Pew Research Center. Vernon Geberth, a retired commanding officer of the Bronx homicide division with more than four decades experience working in homicide, wrote the definitive manual on solving homicides. Geberth said there is a key reason why African American killings go unsolved more frequently than those of white people. He said that results in 'multifaceted' factors that make it harder to clear those homicides – including overwhelmed inner-city police departments, district attorneys offices that won’t take cases they don’t think they can solve and the vice-like grip that gangs have within those communities. Stephen Lurie, research and policy advisor at National Network for Safe Communities, said that the disparity is more complex than the 'no snitch' culture prevalent in many poor, black communities across the country. He also noted the harm done through the many incidences, all across the country, of white police officers shooting and killing unarmed black people and facing little to no consequences for their actions. 'They’re unable to solve those (African American) homicides because there is a broken relationship with the communities,' Lurie said.